Should You Replace Exercise With Vitamin C? HomeDIETShould You Replace Exercise With Vitamin C? Vitamin C may be as good for your heart as exercise is, according to researchers from the American Physiological Society, but don't go swapping your dumbbells for that orange-flavored chewable just yet. The researchers measured the activity of endothelin-1 (ET-1), a protein that constricts small blood vessels. Individuals who are overweight or obese have elevated activity of this protein, which can lead to an increased risk of heart disease. They found that a 500-milligram (mg) supplement of vitamin C lowered ET-1 activity as much as walking for exercise. "Based on this study, I'd still use exercise as my first recommended intervention for patients with heart disease, but adding vitamin C to the mix can't hurt," says Jordan D. Metzl, MD, author of The Exercise Cure. "This study might prove helpful for people who are at risk for heart disease and not able to use exercise as part of their recovery or prevention program from heart disease." That said, vitamin C still isn't a replacement for exercise. "I would never tell a single person to replace exercise with a supplement or drug," says Mark A. Moyad, author of The Supplement Handbook. "Exercise is simply the greatest drug or supplement ever invented, if you look at comprehensive benefits, from cancer and cardiovascular disease reduction to reducing depression, anxiety, and stress." Dr. Moyad points to a potential flaw in the study, saying that focusing on ET-1 is problematic. "What this study does is focus on one specific marker out of many and says, 'Hey look at what this does!' It does not mention the impact of vitamin C on LDL, blood sugar, blood pressure, weight loss, or countless other real-world and more proven risk factors for heart disease." In fact, ET-1, while interesting, is not a metric most doctors consider, even when looking at patients already at risk for heart disease. Furthermore, Dr. Moyad says, other research (in healthy individuals) suggests that vitamin C could even hurt your workout. While free radicals are usually considered a bad thing, they're necessary to build muscle. 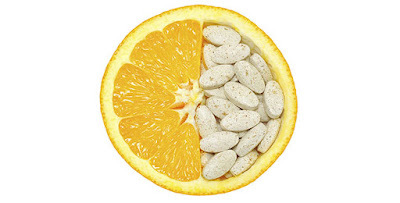 "Higher vitamin C dosages could also reduce free radicals that form during exercise that are actually needed to stimulate some of the muscle building and fat burning," he explains. Very high doses of vitamin C can increase oxalate levels, too, which increases the risk of kidney stones. But, there is one benefit to taking vitamin C for your workout—and that's to prevent getting sick. "It is absolutely possible that vitamin C could improve blood flow in those that are overweight or obese, and this is a fairly safe dosage, but there are far more studies that show exercise in combination with vitamin C could reduce the risk of colds and infections while on an exercise regimen," says Dr. Moyad. "I have no problem with a 500-mg supplement," he says, "as long as the person is still moving. As a substitute, it sets up a dangerous precedent where people begin to think pills substitute for lifestyle changes."